This is my 2nd Stephen King novel. My first was Joyland, and that one didn't go over too well! My interest was piqued with this one because of the "Carrie Craze" happening right now due to the remake. Now I have been a lover of horror movies all my life, so I know the Carrie story very well because of the movie(and all it's unnecessary remakes!). I went into this novel knowing the story very well. However, that did not change the terrifying reading experience! I almost found it even more heart-wrenching to read about this story than seeing it unfold on the screen. Even though the outcome of this novel is horrifying, you absolutely cannot help but sympathize with this poor girl. 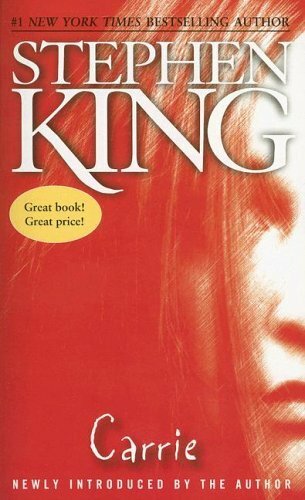 I enjoyed the flow of Stephen King's writing style so much more in this novel. With Joyland, I had a horrible time connecting with the characters because the writing style was so descriptive that it totally took away from the characters and storyline. That was not the case with Carrie. Although this is a very heavy and dark novel, I could not help but devour it! Stephen King, you redeemed yourself with Carrie. I am sorry I ever doubted you! I love your blog ! It is awesome you gave Stephen King another chance ! Some of my all time favourite books. What a dark, twisted mind he has. Carrie was the first Stephen King book I read many, many years ago. The story lines don't really ever transfer to the big screen. I think it is because the characters are developed to such depth, that there personalities can never be fully realized in a two hour film, or even a mini series. Which Stephen King book will you choose next ?? I would love to read a Stephen King book he is such a gifted author, but I'm a wimp and don't read horror stories. I really need to read Stephen King! I keep putting it off. The only thing of his that I have read is On Writing, and it was brilliant. At least, enough to make me want to read his other books, but I know they are so vastly different that I haven't gotten into them yet. Sigh. I'm definitely more likely to now that I know you liked Carrie!